The sales role, unlike any other business profession, is critically dependent on sales coaching. Successful selling today, much like playing a round of golf, has dozens of intersecting challenges that make it difficult to do well. That’s why the best golfers, and the best sellers, have great coaches who help them get to the top of the leaderboard. Few sales managers, however, know how to be that kind of coach. They swing between berating their salespeople to ignoring them completely, with all kinds of unforced errors in-between. Here are the four most repeated sales coaching flaws I’ve observed in two decades of working with sales organizations large and small, recounted as actual statements struggling managers said to me. Sales Coaching Flaw One: I figured it out on my own, they can too. Most sales managers at one point in their career were salespeople. And most of these sales managers were successful salespeople, or they wouldn’t have been promoted to the position they have now. It’s why the best athletes in any sport rarely (if ever) make the best coaches. They learned how to do what they do intuitively, no one taught them. So they find it next to impossible to break down the process into a step by step system, because they never had to do that themselves. I’m willing to bet that if I asked Stephen Curry how to make a jump shot from the three point line, he would shrug his shoulders and say something like, “I don’t know, you just do.” Not helpful to mere mortals like me. Similarly, most people don’t know how to sell intuitively, they need to be taught. Even those who bring an enormous amount of natural talent to the table still need to be shaped and molded, because today’s sales marketplace is incredibly complex and demands a high degree of skill to work well in it. Most salespeople aren’t able to master this skill on their own. And, if the truth were told, you probably didn’t either. Someone showed you the way. Someone helped you down your path. Be that someone for your team. Sales Coaching Flaw Two: I’m not a micromanager. Perhaps the biggest insult you could give a sales leader today—or any leader for that matter—is to call them a micromanager. Who wants to be an insistent, overbearing, belligerent boss? So many, if not most, of the sales managers I work with avoid truly coaching their salespeople for fear of being given the dreaded micromanager label. Or they settle for being a cheerleader, spouting inspirational slogans from the stands, which is very, very different than actually being in the game. So let’s take a moment to define micromanagement. Micromanagement is not providing direction when direction is needed. If someone doesn’t know how to thoroughly prepare for a first appointment, and you teach them how to do that, you’re not being a micromanager. You’re being a good coach. Micromanagement is continuing to provide direction when direction is no longer needed, like sitting down with all your salespeople and insisting on seeing every pre-call planning report before they go on any appointment and always adding your two-cents. This kind of over-supervision is what people resent, because it makes them feel like little children, even though they’ve proven themselves trustworthy adults in completing that task. Sales Coaching Flaw Three: They can’t handle the truth! This is the opposite of not being a micromanager: constant confrontation. Sales managers who embrace this style, ironically, have some success with it. Initially. In a world where everyone’s afraid of being called a micromanager, a leader who actually tells someone what to do is refreshing at first. Even invigorating. But then it becomes exhausting. Constant confrontation over time shuts down open communication, stifles creativity, and destroys productivity. Mysteriously, salespeople who work for a leader like this transfer to other parts of the organization, or to another company entirely. The secret to successful sales coaching is knowing what to do and when, what to say and when. That is, adapting your coaching style to the needs of the moment: not treating everyone exactly the same way every time, not treating, even, an individual sales person exactly the same way every time. A successful sales coach provides his or her team with the leadership they need when they need it. Yes, at times, that means being very directive, but at other times it means being completely silent, saying nothing. Mostly, however, sales coaching is about asking good questions and letting people think for themselves. Sales Coaching Flaw Four: It’s their job to set up the deal, my job to close it. This happens, mostly, at the end of the month or at the end of the quarter, and everyone is happy because the team hits their number. The happiness, however, is short-lived, because it says to a sales person—in a not so subtle way—that they’re not capable of winning deals themselves. It also limits close rates to what a busy sales manager is physically present to approve, placing a strategic chokehold on the business. In other words, this fatal flaw kills salespeople, sales managers, and sales results alike in a most deadly manner. So let me be clear. It’s not a sales manager’s job to close deals, it’s a sales manager’s job to make sure deals are closed. This is no mere exercise in semantics. It’s the difference between being an effective coach who empowers your team to win or an ineffective player/coach who checks yourself into the game at the very end to try to win it for yourself. The latter is a foolish myth, and the former is the secret to success. Does that mean you never close a deal as a sales manager? 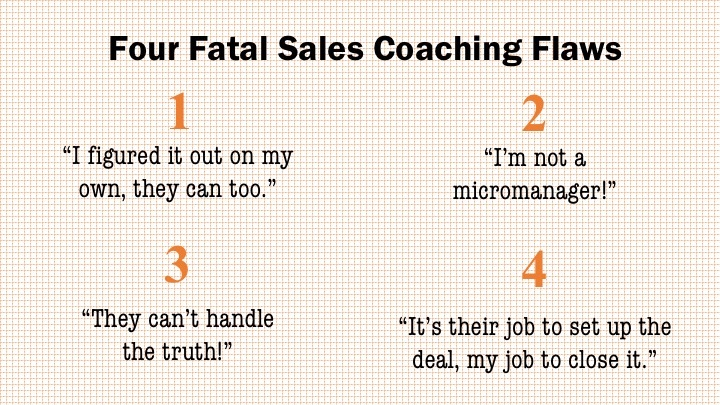 Please refer to the advice I gave in Fatal Flaw Three: the secret to successful sales coaching is knowing what to do and when. If that means a rep needs your help closing a deal, you help them close a deal. Just make sure this is a true developmental issue and that your help will lead to expanding individual sales capacity (not a secret desire for you to “get back in the game, baby”). There are few things more satisfying in business than leading a sales team to success year after year after year. You watch reps who couldn’t pick up the phone for fear of their very lives boldly bring in a six figure salary. You watch other reps who skipped from company to company land on your team and become your most loyal supporters. Yes, sales management is the greatest leadership laboratory on the face of the earth, and the number one lesson you’ll learn in it is how to coach people to greatness. Avoid these four fatal flaws, they’ll kill both you and your team, and embrace the challenge of providing your people with the leadership they need when they need it.